Dürrenmatt is a much more interesting writer than his thin English-language profile suggests. It is therefore a pleasure to welcome the University of Chicago Press’s three-volume collection of his writings—plays, fictions, and essays. The volumes are splendidly translated by Joel Agee and severally edited and introduced by Kenneth J. Northcott, Brian Everson, and Theodore Ziolkowski. The introductions provide a solid grounding in Dürrenmatt’s work, and they help us to understand what it meant to be a German-language Swiss writer in the immediate postwar period. In America, of course, we have no truck with neutrality. All the more reason to take seriously—that is, to think seriously about—approximately three volumes worth of thinking might help—the reflections of a neutral observer, who believes that there can be no real freedom without justice, and, in a militantly divided world (whether it be a cold war or a clash of civilizations), justice is the scarcest thing of all. 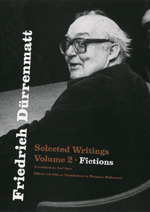 Our Friedrich Dürrenmatt Web site has writings by and on Dürrenmatt, plus an illuminating interview.